The nozzles listed here are for Snugburners fitted in central heating Rayburn OF22 and 222K range cookers. These models were originally fitted with twin trough burners. 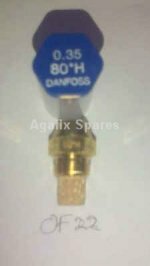 The nozzle is a Danfoss 0.35 x 80oH.